What to do with all those lentil, pea and fababean stubble acres from 2016? Canola on pea or lentil stubble? Or maybe barley? Contrary to conventional thinking, research supports mixing it up. O’Donovan’s study is consistent with other research on the Prairies over the last few years. In Saskatchewan, research by Randy Kutcher, formerly of AAFC Melfort and now at the University of Saskatchewan, found canola yields were higher when canola was grown on field pea compared to wheat residue. Other research at the University of Alberta found canola grown on field pea or fababean residue without nitrogen (N) fertilization yielded higher or equal to canola grown on barley or canola residue with N fertilization. In O’Donovan’s research, field pea, lentil, fababean, canola, and wheat harvested for grain, as well as fababean grown as a green manure (GRM), were direct-seeded at seven locations in 2009: at Beaverlodge, Lacombe and Lethbridge in Alberta, at Scott, Indian Head and Swift Current in Saskatchewan, and in Brandon, Man. Canola was seeded in 2010 and barley in 2011, with fertilizer nitrogen applied at zero, 30, 60, 90, and 120 kilograms per hectare (kg/ha). In the year following field pea, lentil, fababean, wheat, canola and fababean GRM, hybrid canola was seeded. Averaged across locations, there was a 27 per cent increase in canola yield following fababean GRM compared to where wheat was the preceding crop. Canola yield tended to increase following field pea and lentil compared to wheat stubble. 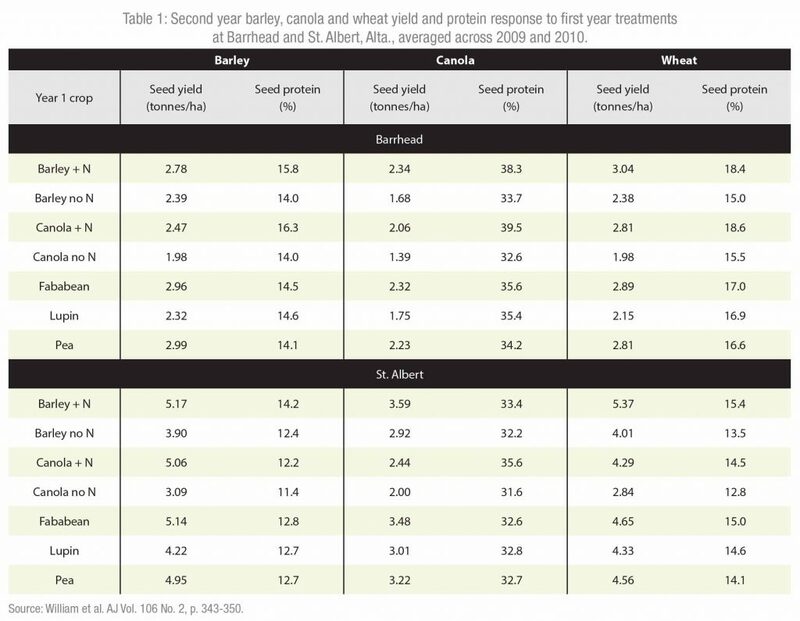 Compared to wheat as the preceding crop, field pea significantly increased canola yield at Indian Head, Swift Current, and Brandon, while canola yield was higher on lentil stubble compared to wheat stubble at Beaverlodge, Indian Head, and Swift Current. On average, compared to wheat stubble, canola yield increased by four bushels per acre (bu/ac) on pea stubble and about six bu/ac on lentil stubble. Averaged across locations, growing canola after canola significantly reduced yield by 3.4 bu/ac (eight per cent) compared to when wheat was the preceding crop. In other studies led by research scientist Kelly Turkington at AAFC Lacombe, similar results were found across the Prairies. Turkington’s work focused on malt barley production and compared growing malt barley on either barley, canola or field pea stubble. He found barley yields were 20 per cent higher when planted on field pea residue and 11 per cent higher on canola stubble compared to barley stubble. Additionally, planting malt barley on field pea stubble did not result in a significant increase in grain protein content. Turkington explains the factor that resulted in the largest and most consistent increase in grain protein level was increasing the N fertilizer rate from 50 to 100 per cent of the recommended rate. At the University of Alberta, Christina Williams also looked at the effects of pulse crops on subsequent yield and protein content of barley, canola and wheat. 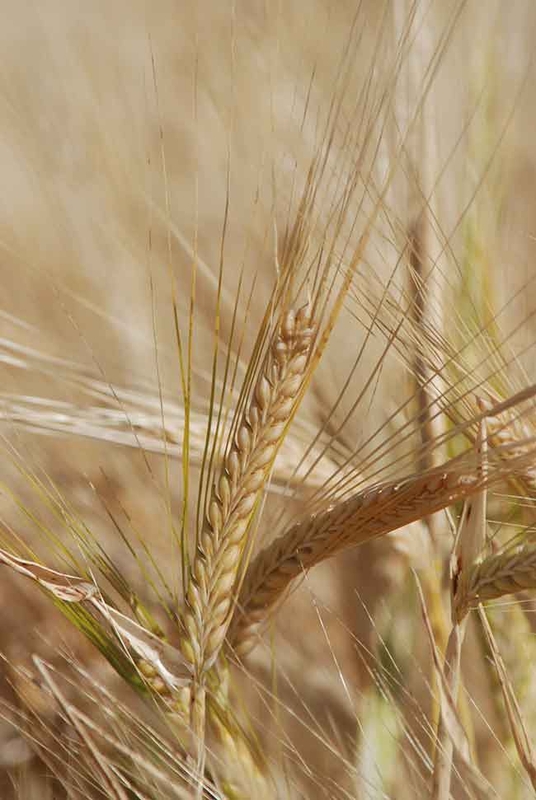 The research was conducted at Barrhead and St. Albert, Alta., in the relative dry years of 2009 and 2010, which predisposed cereal crops to lower yield and higher protein. She found the highest (and statistically similar) barley, canola and wheat yields were on pea and fababean stubble without added N, and on barley and canola stubble with N applied to soil test recommendations. When Williams looked at protein content of barley, she found protein content was high at the dry Barrhead site across all treatments ranging from 14 to 16.2 per cent. Barley grown on pea and fababean had statistically similar protein content as barley grown on canola or barley stubble with no added N, which were the lowest of all treatments. Barley seed protein at St. Albert on “+N,” fababean, and pea stubble was even greater than “no N” stubble. In O’Donovan’s study, in the second year following the preceding crops, green manure fababeans generally produced the highest yields. Averaged across locations, there was a 14 per cent overall increase in barley yield where fababean GRM rather than wheat was the preceding crop. Averaged across locations, there were seven and six per cent overall increases in barley yield on lentil and field pea stubble, respectively, compared to when wheat was the preceding crop. Averaged across locations, slight increases in barley kernel protein concentration occurred when fababean GRM and lentil were the preceding crops, while field pea had no effect. O’Donovan says these slight increases were unlikely to result in unacceptable protein concentrations for malting barley because the protein content was still quite low. Based on O’Donovan’s research, growing canola or barley on pulse stubble presents two options for managing N fertilizer applications. He explains that if a producer were basing N management on a target yield, less fertilizer N would be required to maintain a given canola yield when field pea or lentil rather than wheat were the preceding crops. The other approach would be to maintain N application and attain a higher yield. “The results indicate growing field pea or lentil as cash crops before hybrid canola can improve canola and subsequent barley yield without having a major negative impact on canola oil or malting barley protein concentration,” O’Donovan concludes. Growing malt barley on pulse stubble did not result in higher protein content.